James Franco catches a lot of flak. It’s easy to forget he is, among other things, a semi-accomplished author. Yosemite, the full-length directorial debut by Gabrielle Demeestere, adapts Franco’s collection of short fiction Palo Alto. (The same work was the basis of a 2013 film directed by Gia Coppola.) The movie’s a loose slice-of-life triptych about three fifth graders who live in Palo Alto in 1985 as they seek relief for various losses. 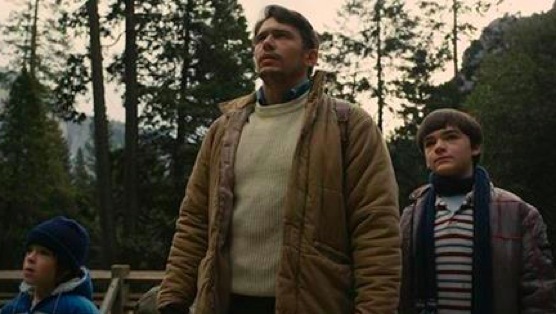 The first story follows Phil (James Franco), a divorced, six-years-sober father who brings his two young boys to Yosemite National Park. Immediately the film’s fused with a sense of dread, as a radio announcer warns that a mountain lion has found its way into Palo Alto, a California suburb, and has attacked several children. But the three are removed from that, heading into the very wilderness that’s creeping into their suburban existence. The pulled-back shots of the park’s massive landscapes evoke a traditional sense of traditional awe—a feeling of insignificance and meaninglessness seeps through the valleys of great mountains. When the boys stumble upon a fire with a rib cage roasting atop it, the older boy Chris (Everett Meckler) tries to convince his father the bones are human. Knowing better, Phil calls the park rangers and discovers it’s the remains of a bear. Chris seems unconvinced, and why he needs those remains to be human is obvious as the short ends. Quiet as it is, his sparse dialogue cuts. “We still love each other in our own way,” Phil says of his ex-wife. “That’s not what Mom says,” his eldest replies. The second story follows Joe (Alec Mansky), a young boy whose brother has recently died. He befriends the much older Henry (Henry Hopper), who invites the boy over for soda and comic books. Henry’s intentions are as disturbing as you might expect, and though Joe learns he doesn’t like Henry’s head resting in his lap, he continues his visits. The third tale belongs to Ted (Calum John), a boy whose father has insomnia and spends his evenings with strangers on the newly founded internet. Bored and lost, he, Chris and Joe decide to hunt the mountain lion that’s been terrorizing the community. They bring with them a gun found in Chris’ house. At first glance, dread seems to be the common thread. After all, a large cat is striking fear into the community. But the fear, as is generally the case, is only a byproduct of loss and confusion. A teacher makes clear that the mountain lion isn’t attacking children for sustenance. It actually seeks water, and Palo Alto has spread into its habitat, not the other way around. The young boys are as lost as that lion. They understand very little about the world. They don’t understand insomnia or guns or sobriety or sexuality or danger. Most of all, they don’t understand death, in any form—death of a pet, a brother, a mountain lion, or a marriage. Many will call Yosemite a coming-of-age story, but that would be a disservice to the genre. In those stories, people grow. They come of age, and transformation is key. Yosemite lacks that entirely. It doesn’t twist or turn or surprise. No one grows, only shifts. Whatever can go wrong likely will. This is a pessimist’s playground, especially if said pessimist lives in the guise of a realist. It’s about the deep, horrible aloneness of childhood, which is different than loneliness. For all that, though, Yosemite comes off as what it is—three pieces of short fiction loosely strung together by theme. While the film feels truthful enough—the boys’ allegiances change constantly, compassion and cruelty are both close at hand—it falls into a drama’s worst trap. From the opening moments, that ennui bleeds so heavily through the shots, gorgeous as they are, that viewers are left to wonder why they care in the first place. In Yosemite, life might be difficult, confusing and painful. But it also never really seems worth living. Travis M. Andrews is an arts and tech journalist based in Washington, D.C. and New Orleans. He has written for TIME, Esquire, The Atlantic, Mashable, Syfy, The Washington Post, The Times-Picayune and others. When he was younger, he wrote on his mother’s walls. She was displeased. You can visit him on his website or follow him on Twitter.